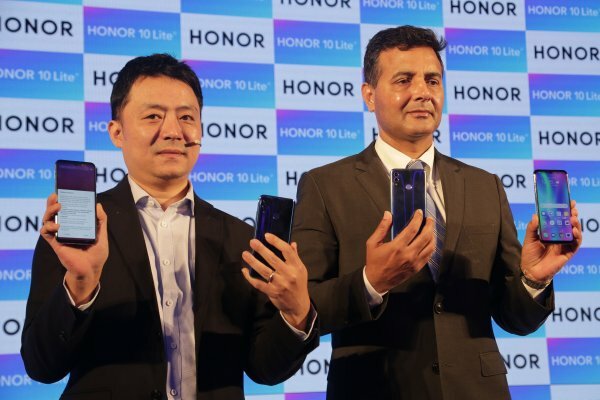 Honor, sub-brand of Huawei Group, today launched the Honor 10 Lite in India. This phone is packed with 24MP AI Selfie camera, dewdrop display and a shimmering color gradient back. This smartphone will be available in 4GB + 64GB at INR 13,999 and 6GB + 64GB at INR 17,999 in Sapphire Blue, Sky Blue and Midnight Black colors exclusively on Flipkart. This phone sports a 6.21 inch (2340 x 1080 pixels) Full HD+ display with an aspect ratio of 19:5:9. The screen also comes with TUV certified eye care mode to prevent your eye with any damage due to harmful blue light. It is powered by Octa-Core Kirin 710 12nm processo with ARM Mali-G51 MP4 GPU. It comes in two variants of 4GB LPDDR4X RAM / 6GB LPDDR4X RAM with 64GB storage which can be further extended upto 256GB with microSD card. This phone is packed with 3400mAh battery. For imaging, this phone is equipped with 13MP rear camera with LED flash, f/1.8 aperture and secondary 2MP camera. For selfies, it has 24MP front-facing camera with f/2.0 aperture. It incorporates AI scene detection technology on both rear and front cameras. The AI camera can recognize eight different scenes (Sky, Beach, Plant, Flower, Stage, Night, Room and Snow) and adjust camera settings to click best selfies. The front camera also features AI based facial recognition and light fusion technology, ensuring you always look your best in every scenario and light condition. Dual 4G VoLTE, Wi-Fi 802.11 ac, Bluetooth 4.2 LE, GPS + GLONASS.